Bio: Ms. Kinkade is a graduate of Boston University; she was designated a Master Pastelist with the Pastel Society of America in 1985. She is a founder of the Viridian Print Studio and a signature member of the PSA, Knickerbocker Artists USA, CLWAC, Pen & Brush NYC, and the National Association of Women Artists. She is Artist in Residence at Van Vleck Gardens in Montclair NJ, and has taught for many years at the Montclair Art Museum. "Catherine Kinkade's work follows a colorful landscape tradition that is an interesting combination of Pierre Bonnard and Richard Diebenkorn. Her large paintings, which rely on clear graphic arrangements, encompass appealing agricultural vistas that seem to go on forever though they never lose their adherence to the picture plane. Her smaller works have an intimate delicacy that makes them quite immediate and fresh." Media: Pastel ; oil; monotype. Style: See quote from Steven Miller. Navigation: Main menu always available at side of page. Gallery: Painting, Monotype, Pastel, Champagne, Normandy, Studies, Commissions. Image View: Click to enlarge thumbnail in new page; enlargements have details of size and medium. Download allowed. 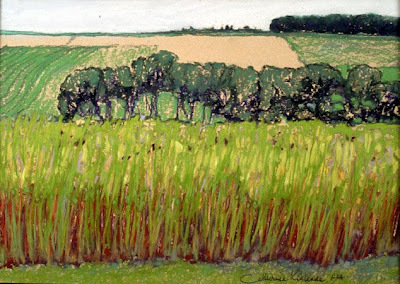 The image featured, Champagne Fields, is 21x26 ins, 634x450, 113 KB.